My basketball career was nothing to completely brag about but it had its moments! It included a few trips to state tourneys including a 3rd place my junior year in what will stick in my mind as one of the greatest comebacks ever! I also became a favorite of a local sports anchor who gave me a ton of face time for my classic white boy long range shooting ability. You may have heard of the guy since he now sits in as an anchor on ESPN, Dari Nowkhah. So besides my fun time playing what I truly enjoyed was all the fantastic shoes I was able to wear throughout my years playing. I found photos of most of my favorites although there are still a few out there I was unable to track down. I rocked this shoe for an entire summer and loved it. 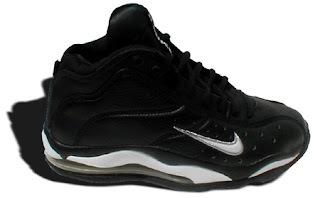 Mine was actually black on black with the neon green air bubble and was one of the best shoes I’ve ever worn performance-wise. 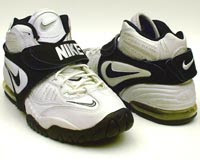 This shoe actually led me to a Spokane basketball camp MVP and Chip. Woohoo! 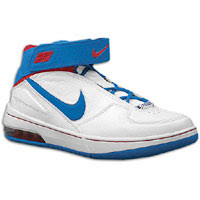 This was my 5th grade every day shoe but for some reason Nike decided to call it a basketball shoe. 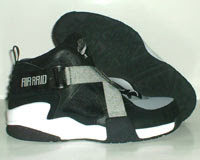 Not only was this the heaviest damn shoe ever created, it was also way ahead of of its time for looks. Many thought it was ugly as hell, but damn did I think I was fly. Sure enough, years later, it’s fashion! 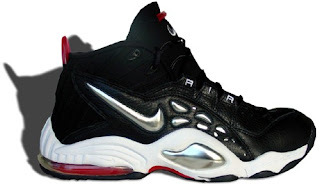 This was a fantastic looking shoe with the metallic ball and red bubble accent. 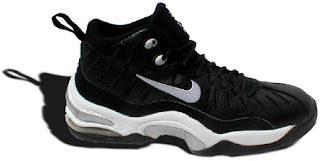 I do remember the top rim becoming a little uncomfortable if you laced them up too tight but this was a shoe you could rock on the street and not just the court. This shoe ranks in my top 3 for performance of all time. Mine were actually all white, but I wore this shoe until the sole practically fell off. See back in the day, Nike wasn’t re-releasing shoe after shoe and once your shoe was beat to death, you couldn’t just pick up another pair. And don’t forget these shoes came with colored straps! My favorite Jordan of all time! The patent leather! The gummy sole! This was my color scheme and I actually held on to these for years and tried to keep wearing them even after my foot outgrew them. I’m sure Jordan aficionados will disagree with me but this shoe looked so fly and performed at the same time. Probably my least favorite Jordan of all time was the Air Jordan 9. This shoe looked crazy but was the worst game shoe I’ve ever worn. No grip, and not much support ruined this shoe for me. Now would I wear this one out at night? For sure, but never again on a basketbal court. Another amazing Jordan that performed as well as it looked. The double straps with the mini carpet piece on the tongue was so hot! My color scheme was with the red accent instead of the grey (pictured) but was still just as fly. A top 5 choice for sure. One of the all time best looking shoes! This was my color scheme but there are so many out there to choose from now that you just can’t go wrong. The sole did turn a nasty yellow color after a few months on the street but what an amazing shoe on or off the court. Loved ’em! My current shoes! How amazing are these? I’d have to rank them in my top 5 for comfort, looks and performance. I love this shoe and I baby it like crazy. This shoe will never touch asphalt and will only show itself on the hardwood. My current outdoor court shoe! It’s not a bad shoe and definitely carries a lot of support. The white, blue and red color scheme is not my favorite but I got these bad boys for like $50 bucks on Eastbay right before the summer 3on3 tournies started last year. Another amazing shoe from Nike that let you personalize before Nike iD existed. Of course I had my high school team colored straps and thought I was hot as hell! This was amazing on the court and still carried itself off and will always rank high with me. Is all you wear Nike? I grew out of that brain washing phase quickly. I love Jordan but I never thought his shoes were great game sneakers. An Nike as a whole I think are heavy, clunky and overpriced. When wearing sneakers to walk around in was cool Jordan’s were the ish. He knew that and now I don’t even think ppl play in Jordan’s much anymore. They are a high priced casual shoe now. Give me some adidas today to ball in. Our team shoe for a couple of years was the adidas superstar when it first came back and I liked those but I’m blessed with a skinny a$$ foot and Nike tends to run pretty narrow. I did have a few pairs of Iverson Answers that I loved with the DMX but most shoes other than NIke were too damn wide for my little foot. I appreciates Nike for the air technology. Nike shoes really help me for a better performance.